US, 1938, 100 minutes, Black and white. Gary Cooper, Sigrid Gurie, Basil Rathbone, Alan Hale, Binnie Barnes, H.B.Warner, Lana Turner. The film starts off somewhat as a serious historical adventure. Half way through it seems to move into comic matinee material with tongue-in-cheek treatment. Overall, the impact of the film is odd and it is uncertain how one should respond to it: seriously or not so seriously. 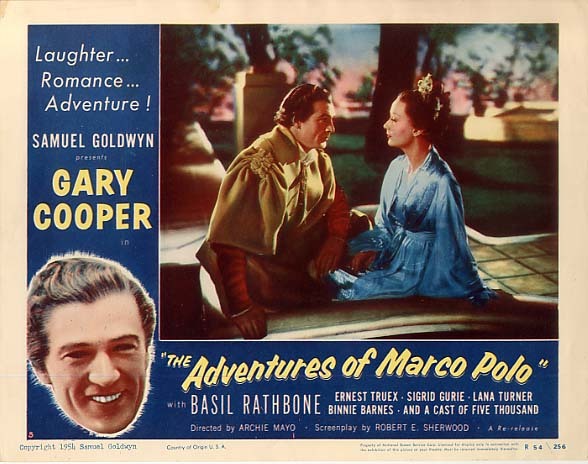 Gary Cooper seems an unlikely candidate to be Marco Polo. He carries off the role with his usual solid presence. Perhaps here it is a slightly stolid, manner. Basil Rathbone is at hand to be a villain. The film is episodic, shows something of the trade interests of the West in China, highlights a little of the Chinese discoveries of such things as gunpowder and spaghetti and gives a glimpse of Genghis Khan. All in all an entertaining though slight seeming hotch-potch of an adventure film. 1. Audience interest in Marco Polo? His status in history? Exploration, trade, the meeting of East and West? 2. How could this film bent be described? Adventure, romance? How comic? The consistency of the tone of the film? The tongue-in-cheek screenplay? 3. Black and white photography, the use of sets for locations? Musical score? Special effects especially for the battles, gunpowder, etc.? 4. How close to history did the screenplay stay? How important was this? Italy and the West in the 13th and 14th centuries? The possibilities of exploration and treks to the East? China and trade? Inventions? The links between East and West? Genghis Khan and his role in the East? How were these presented - historically, by way of entertainment adventure? 5. Gary Cooper's style as Marco Polo - Cooper's age, presence? His being presented as romantic hero in Venice? His servant and his assistance throughout the journey? The commission by his father? The sketching in of the long trek? The arrival in China, ways of staying in Peking, the friends made? The emperor and his daughter? The hostility of the emperor's minister? the discovery of gunpowder? Falling in love with the Princess? The manoeuvre by the minister to have him go to the rebels? His arrest, vindication of himself? His return to Peking, the use of the gunpowder, the defeat of the minister? Marco Polo turning from historical character into Errol Flynn type adventure hero? 6. Genghis Khan - the figure of history, his place in China, his minister, rebellion in his empire, his rule of Peking? His daughter? Attitude towards Marco Polo? The war with Manchuria? His defeat? Final victory? The usual king figure of such adventures? 7. Basil Rathbone's sinister style as minister? His place in the court, a foreigner, his manoeuvres, the Princess and his advances, arrangements for marriage? His intrigue for killing Marco Polo? The defeat of the Emperor? His taking over an Emperor? His final defeat? 8. The Princess as heroine, her father, love for Marco Pole, rejection of the minister, her being used? 9. The sympathetic Chinese, especially the old man? The later use of the gunpowder? Marco Polo's servant? 10. The tribes at the border, the leader and his infatuation with the women, his wife and her infatuation with Marco Polo? The parody of the romantic comedy and mix-ups? Their participation in the revolt, their coming to the aid of Genghis Khan? 11. The sequences in China and the ordinary life of the Chinese people? Life amongst the rebels? The minister and his manner and the final culmination in his downfall and the battles? 12. What did the film have to say about historic heroes and their treatment, the wars of the past and the way they can be seen for entertainment value? The comments on the inventions of the East and their place in the Went - especially gunpowder! ?